Our Michigan pedestrian accident lawyers represent clients who were hit by a car while crossing the street. This includes pedestrians and joggers who were struck in both crosswalks and in locations that did not have crosswalks. In both circumstances, the injured person has a number of legal rights that should be pursued for injuries suffered in the accident. A person hit by a car while crossing in a crosswalk with a green light has a very good case against the negligent driver. The driver may have hit the pedestrian simply because he or she was distracted or just not paying attention to the pedestrian in the crosswalk. Many times, the motorist will make a right turn into the street without first looking to see if a pedestrian was attempting to cross the street. A pedestrian hit by a car in the middle of a street or outside of a crosswalk may also have a strong case against the negligent driver, but this depends on the particular facts of the accident. Factors include the lighting conditions at the time, the speed limit in the area, whether the driver was distracted, and whether other motorists were able to see the person in the roadway before being hit by the car. Witness statements are often the most important evidence in determining if there is a good case for this type of injury accident. Can I Get No-Fault Insurance Benefits For a Michigan Pedestrian Accident? Michigan No-Fault insurance benefits are automatically available to every pedestrian hit by a motor vehicle in Michigan. You are entitled to these benefits even if you did not own a car or have an auto insurance policy. If there was no auto insurance for the pedestrian or any member of the household, the claim is made against the Michigan Assigned Claims Plan. A claim is filed with the Plan and then assigned to an insurance company to pay benefits. Other no-fault insurance benefits include payment of lost wages, household services, attendant care services, medical mileage, and transportation to and from medical appointments. In cases involving more serious injuries, the insurance company is required to pay to modify a home and vehicle to accommodate the special needs of the accident victim. Can I Sue the Person who Hit Me for Personal Injury Damages? Yes, a pedestrian hit by a car can file a personal injury claim against the negligent driver. Again, this can depend on the factors involved in the accident settlements can include claims for your pain and suffering, disability, and scarring or permanent disfigurement. The liability insurance company for the negligent driver and owner of the vehicle will pay the settlement. If the driver was not insured at the time of the accident, you may still be able to file an uninsured motorists claim to receive a settlement. 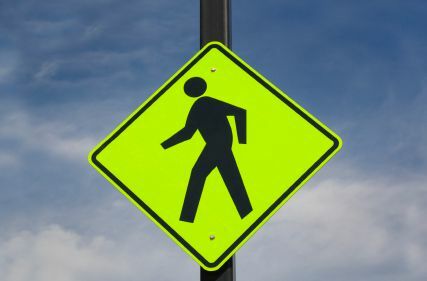 What is a Pedestrian Accident Wrongful Death Lawsuit? If a pedestrian is killed from being hit by a car, the surviving family members can file a wrongful death lawsuit. Wrongful death settlements include compensation paid for both non-economic and economic losses. Non-economic losses include the loss of emotional support, comfort, companionship, society, moral support, and consortium due to death of the loved one. Non-economic claims also include compensation for the decedent’s pain and suffering from the time of injury through the date of death. If you or a loved one has been injured in a pedestrian accident, you may be able to recover compensation for your suffering. Call us today at (800) 606-1717 and an attorney will be available to speak with you immediately. We do not charge any legal fees unless you receive a settlement. There is nothing to lose, so call our award winning law firm today!